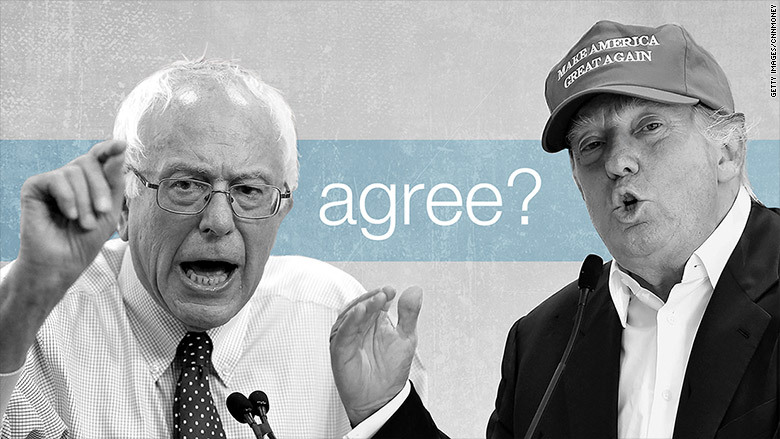 Donald Trump and Bernie Sanders aren't political pals. But they agree on one key issue: they think the U.S. government's jobs numbers are a crock. America's official unemployment rate is a pretty healthy 5.3%. Ignore that, Trump and Sanders say. Sanders told a huge crowd at his recent rally in Portland, Oregon that "real unemployment" in America is over 10%. Trump, never one to be outdone, has been saying real unemployment is "anywhere from 18 to 20%." He calls the official statistic "full of nonsense." Economists may be cringing, but a lot of voters like what they're hearing from Trump and Sanders on jobs. Both candidates are surging in popularity. Trump is leading the GOP field solidly, and Sanders topped Clinton in a recent poll of New Hampshire voters. The economy is almost always the top election issue. Trump and Sanders poll well when voters are asked which candidate would best handle the economy. So are the Presidential candidates right? So should we believe Trump and Sanders? Yes and no. Call it a "half-truth." Sanders says the 5.3% number "doesn't include those people who have given up or are working part-time." He's right about that. Alongside the official rate, the government also reports "alternative" measures of the unemployment rate. One of them is called the "U-6" unemployment rate, but perhaps we should start calling it the "Bernie Sanders unemployment rate." It includes people who work part-time but want full-time jobs and the "giver upers" (people who have looked for work in the past year but not the previous month). The U-6 unemployment rate is indeed 10.4%. But most economists wouldn't call that the "real" rate since part-time workers do have a job, even if it's not the one they want. Trump hasn't explained the math for his high unemployment figure. He talks about Americans getting so discouraged that they just give up on finding work, but that's not enough people to get to 20% unemployment. But how will they create more jobs? While Trump and Sanders agree on the problem, they have very different solutions to fix it. Trump has been light on economic policy details so far, but he has made it clear he thinks too many U.S. jobs are going overseas. "They can't get jobs, because there are no jobs, because China has our jobs and Mexico has our jobs," he said in his campaign announcement speech. Trump is ready to put hefty taxes on imports from Mexico and China in an effort to make those goods more expensive so people will start buying more American products. Sanders prefers to tax the rich and use the proceeds to fund education and job training programs for the poor and middle class. "This campaign is sending a message to the billionaire class: Yes we have the guts to take you on," Sanders said in his recent Portland rally.